The back and forth battle between Greenpeace and Apple has been going on for years, but in its new report, Greenpeace ranked Apple as its No. 1 company. 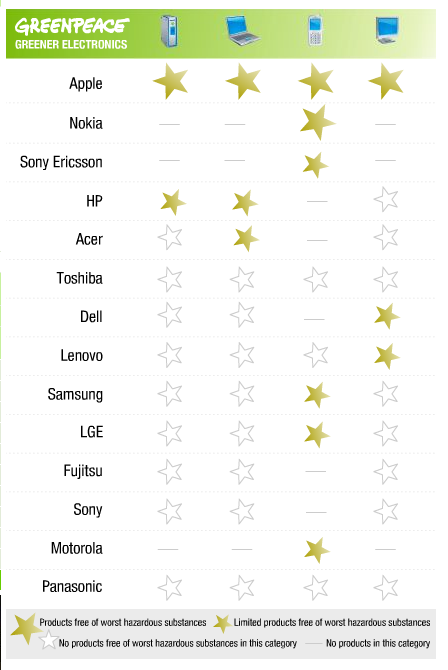 The ranking guide gives consumers an idea of how Greenpeace feels the top 18 consumer electronics companies in the world stack up. The rankings give the companies a gold star for eliminating the most harmful chemicals from their products. The categories listed on the Greenpeace ranking guide are Desktops, Notebooks, Phones and Monitors. “Apple has virtually eliminated toxic PVC and BFRs across the entire product range,” the chart reads. Apple is the only company to receive a four-star rating. Most companies listed in the chart only received one star — HP picked up two. “Apple is leading the way on eliminating toxic PVC and BFRs from all it’s new products with the new iMac and MacBook being the first PC’s copmpletely free of PVC and BFRs,” said Greenpeace. Apple launched its new environmental Web site late last year, clearing explaining to consumers what it is doing to help the environment.